Jessie had no place to go except Whispering Mountain --- and to Teagen, the one person who couldn't deny her, thanks to the correspondence he shared with her dead husband. But what will happen once the man she's loved through his letters discovers her tangle of lies? 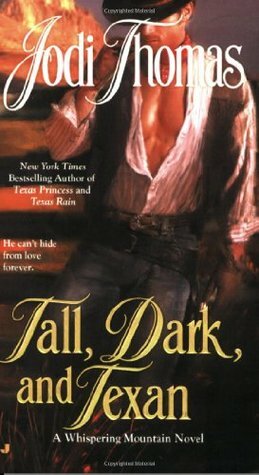 Tall, Dark and Texan is #3 in Jodi Thomas' Whispering Mountain series. Teagan's two other brothers found wives they loved above all else in the previous two books. Now its Teagan's turn. He is rather bowled over by Jessie, who isn't afraid of him, after all she has been communicating with him for years by letter - only he thinks he has been letter writing with Jessie's deceased husband. Jessie is a woman who has known hard times and has had to fend for herself from an early age. She has set of across country with three small girls - a journey taking several months. She throws herself on the mercy of Teagan, with a few small harmless lies here and there. Except Teagan isn't the kind to relish lies - so what happens when he discovers the small discrepancies? Jessie's three girls are all different and a delight. There is Em, the eldest at 7 yrs, she is timid but discovers she loves horses. Rose at 5 yrs has a need to name every pick, cat and horse on the ranch that is unnamed. Bethie is only old enough to endear herself to all and cover them in oatmeal. I took an interest in these girls, because I accidentally read a later novel out of turn, where these girls have grown up. This was an easy and quick read. I enjoyed the developing relationship of Jessie and Teagan, the return of Drum and his pursuit of Sage, and the general goings on of the ranch. Tobin and Travis return at one point to help out, and it was delightful to catch up with them. Family, romance, and a western shoot out - loved it all. I can always trust Jodi Thomas to write well and to entertain.